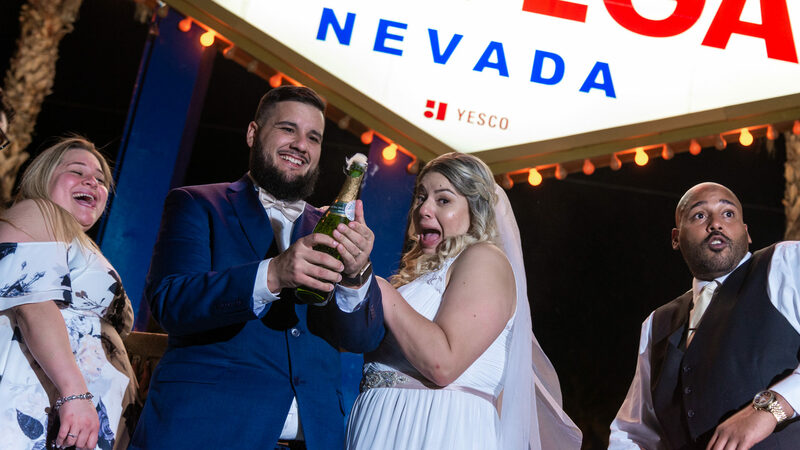 So you decided to get married in Las Vegas? Nevada has made it quick and easy to get your marriage licence in Las Vegas. Here is what you need to know. The marriage licence cost $77 dollars and can only be obtained at the Regional Justice Center located at 201 Clark St, Las Vegas Nevada 89101. The marriage bureau has it's own separate entrance located on the corner of 3rd and Clark. Both parties need to be present with a valid government issued Identification. That is the basics. Scroll down for more info as posted on the Clark county clerks website. Per Nevada Revised Statutes (NRS) 122.200, “Any person who shall make a false statement in procuring a marriage license with reference to any matter required by NRS 122.040 and 122.050 to be stated under oath shall be guilty of a gross misdemeanor.” To view the full statute governing marriage in the State of Nevada, go to NRS 122. Requirements for U.S. citizens and non U.S. citizens are the same, regardless of gender. To obtain your marriage license, both parties must appear in person before a Clerk at a Clark County Marriage Bureau location. Applicants must be at least 18 years of age, and no nearer of kin than second cousins or cousins of half-blood, and not having a husband or wife living. Identification to prove your name and age is required. Please be prepared. Per Nevada law, we may issue a marriage license to couples with acceptable identification. Go to acceptable identification for specific information on forms of identification. In the State of Nevada, marriage records are public documents. Nevada does not issue confidential marriage records. Whoever performs your marriage ceremony has, by law, ten (10) days from the date of the ceremony to file the marriage certificate with our office. Once filed, you can order a certified marriage certificate (proof of marriage) online from our website. A marriage license is issued the same day a couple applies. There is no waiting period to get married after the marriage license has been issued. Marriage licenses are good for one year from date of issue. All U.S. citizens are required to provide their Social Security number on the Affidavit of Application for a Marriage License. You do not need to present your Social Security card. Those applicants not issued a Social Security number by the United States will enter “none” in the appropriate box. For non U.S. citizens, some foreign countries require a copy of the marriage license and/or an apostille to register a marriage. It is suggested that non U.S. citizens check with their local officials for special documents needed to ensure their marriage is recognized in their country. Marriage license copies may be ordered online. When the site comes up, select "Get A Copy Of My Marriage License". Apostilles (Authentication of Signatures) may be required to register and finalize a marriage in a foreign country. Information regarding apostilles can be found under the Licensing Center section on the website of the Nevada Secretary of State. Information on fees can be found under the Clerk Service bar at the left or by choosing FEES. COMPLETE THE ON-LINE MARRIAGE PRE-APPLICATION BEFORE COMING IN TO GET YOUR MARRIAGE LICENSE! Couples using the online Pre-Application should bring their Pre-Application ID number and required identification and documentation to the Marriage License Bureau in Las Vegas, or to a Marriage Services Clerk at one of our outlyinglocations in order to obtain your marriage license. Your Pre-Application will be kept in our system for sixty (60) days from the date of submission. Divorced applicants are required to list the Month/Day/Year when their divorce was finalized and the city and state where the divorce was finalized. We do not need to see a copy of the divorce decree. Widowed applicants are required to list the Month/Day/Year they were widowed and the city and state. We do not need to see a copy of the death certificate. Minor applicants must have consent of a parent or legal guardian. Minors will need an original or certified copy of the birth certificate which lists the name of the consenting parent (no photocopies will be accepted). Legal guardians are required to present a certified copy of the court-ordered guardianship papers (no photocopies will be accepted). A parent or guardian is required to have acceptable identification to prove they are the parent on the birth certificate or the legal guardian on the guardianship order. If a parent giving consent pursuant to subsection 5 of NRS 122.040 has a last name different from that of the minor seeking a marriage license, the county clerk shall accept, as proof that the parent is the legal parent of the minor, a certified copy of the birth certificate of the minor which lists the parent’s first and middle name and which matches the first and middle name of the parent on any document listed in subsection 2 of NRS 122.040. If it is not possible for the parent or guardian to be present, an original, notarized Statement of Consent, in English, must be presented with the original or certified copy of the minor's birth certificate. If the Statement of Consent is prepared by the legal guardian, a certified copy of the court-ordered guardianship papers AND the original or certified copy of the birth certificate of the minor must be presented. The notarized statement should contain the full name of the parent or legal guardian, relationship to the minor, minor’s full name, birth date, and the statement that the parent or legal guardian gives consent for the minor to marry. All documents must be in English or translated into English. A sample of the parental consent can be located here. The minister, religious official, or Nevada Notary Public performing the marriage ceremony MUST possess a Certificate of Permission to Perform Marriages issued by a County Clerk from the State of Nevada. Most churches and commercial wedding chapels use only authorized ministers or religious officials but we suggest you confirm that the minister or religious official is properly authorized. Couples may check the state-wide data base of authorized marriage officiants here. PLEASE SELECT "ALL COUNTIES" BEFORE STARTING YOUR SEARCH. If you do not find your marriage officiant's name, please call the Marriage License Bureau office, 702-671-0580. An out-of-state minister or religious official may obtain permission to perform a single marriage ceremony in the State of Nevada. Please see the Marriage Officiants tab under Clerk Services for information on how to apply for a Certificate of Permission to Perform a Single Marriage Ceremony in Nevada. Your marriage ceremony may be performed at any wedding chapel, church, the Office of Civil Marriages or anywhere your marriage officiant is willing to perform the marriage ceremony in the State of Nevada. The expiration date of the marriage license is listed in the upper left-hand corner. Nevada marriages are legal and recognized all over the world. WARNING: An individual going by the name of "Dr. Linda Harvey-Smith" is not authorized to perform marriages in the State of Nevada. She has performed a number of weddings in recent months and has failed to properly record the marriage certificates. This creates serious problems for the couples involved. Information regarding what to do once you get your marriage license and how to order copies of your marriage records after you are married can be found here. Per recent legislation, a husband and wife, whose record of marriage has been lost or destroyed or is otherwise unobtainable, may be issued a marriage license and rejoined in marriage. This is reviewed on a case-by-case basis and is not eligible for the Online Marriage License Pre-Application process. Under special circumstances, a marriage license may be issued to a couple when only one party can come to the Marriage License Bureau. This office is prohibited from issuing a new marriage license to couples who are currently married. Couples may renew their wedding vows at a church or a wedding chapel. You will need to contact those establishments to see what information is required. The Marriage License Bureau is located in downtown Las Vegas approximately 3 blocks south of the Fremont Street Experience. We are approximately 6 miles north from the heart of the Las Vegas strip. The links below will give you an approximation of traveling via the Deuce (bus) or taxi. The solicitors outside the Marriage License Bureau work for commercial wedding chapels. They are not employed by nor affiliated with The Office of Civil Marriages, the Marriage License Bureau, or the County Clerk's Office.